One of my all time favorite snacks is beef jerky! Whenever we go on a road trip, it is a must have. This past weekend I decided to fire up the Traeger and make some of my own. I used 2 types of meat – sirloin and bottom round – just to see if one would be better than the other. The 2 cuts were about the same price per pound so thought this would be a good comparison. 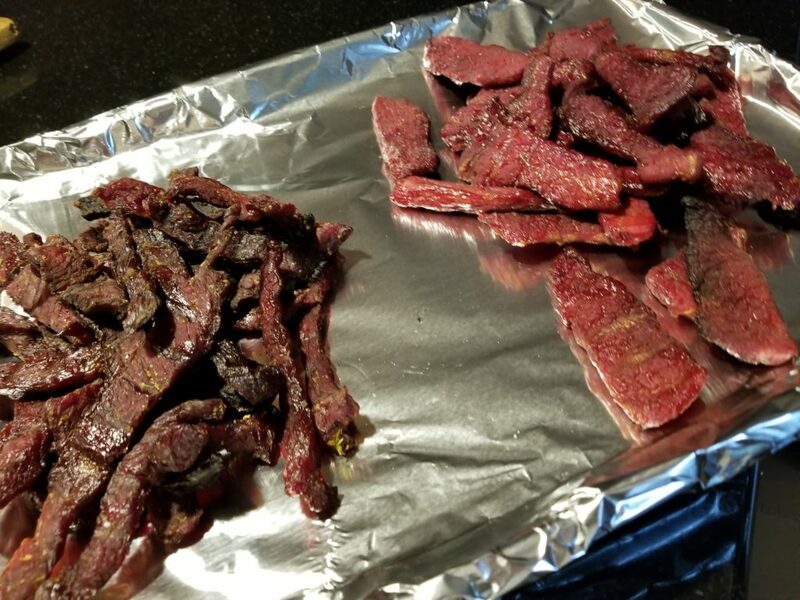 I made a Jalapeno Jerky with the sirloin and a Pineapple Chili with the bottom round. (I used Thai Kitchens Pineapple and Chili sauce in the marinade) First step is to slice the meat into 1/4 inch strips. For easier slicing toss the meat in the freezer for 15-20 minutes. This was the hardest part of the process! I think next time I will have the butcher do this. Next put together the marinades. Place the meat in a bag and pour marinade over the top. You will want to put this in the fridge for at least 6 hours or overnight. 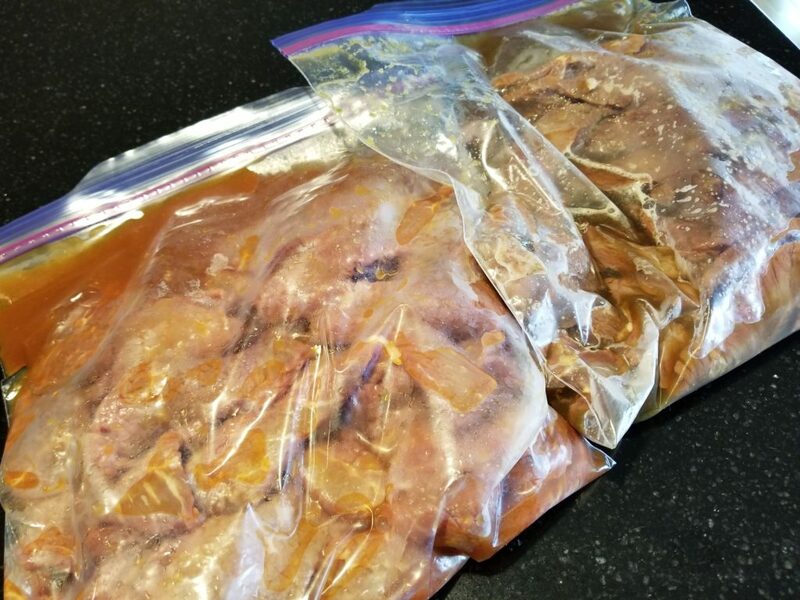 After marinading, drain and discard the marinade. 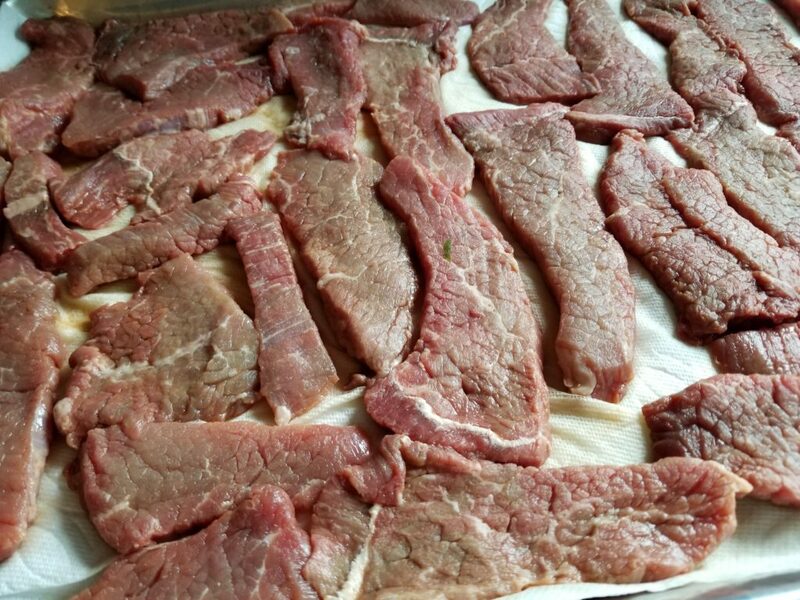 You will want to dry the beef strips on paper towels to remove as much moisture as possible. Now fire up the Traeger on smoke setting. The temp should be 160 – 170 degrees for the entire cooking time. Drop directly on the grill grates and smoke for 4-5 hours. You want to pull the jerky off when the meat is still a bit pliable. Kris and I both liked the Pineapple and Chili the best. No need to stop at the store before our next road trip!! Cheers! In a blender or small food processor, combine the jalapeño(s), lime juice, soy sauce, curing salt (if desired) and brown sugar and process until the jalapeño is finely chopped. Pour into a mixing bowl, and stir in the beer. With a sharp knife, slice the beef into 1/4-inch thick slices against the grain. (This is easier if the meat is partially frozen.) Trim any fat or connective tissue. Put the beef slices in a large resealable plastic bag. Pour the marinade mixture over the beef, and massage the bag so that all the slices get coated with the marinade. Seal the bag and refrigerate for several hours, or overnight. 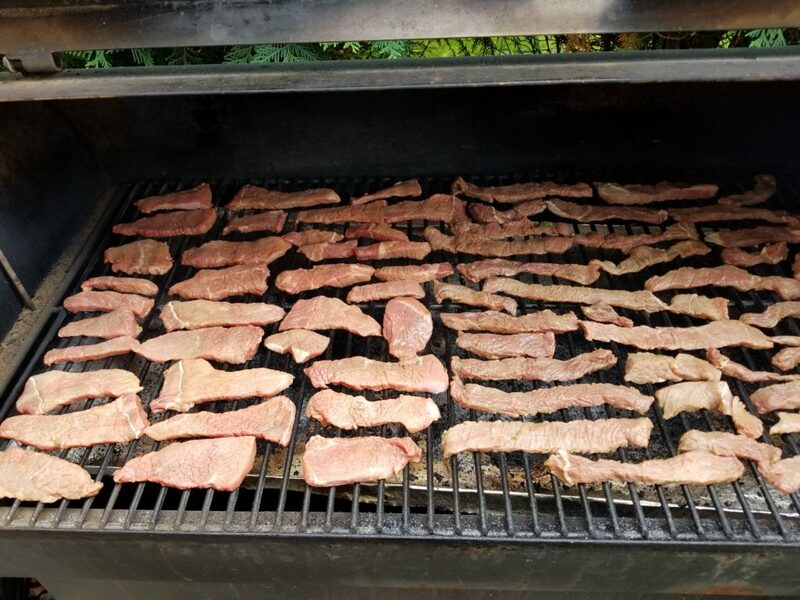 Traeger’s Hot Jalapeno Jerky Smoke for 4 to 5 hours, or until the jerky is dry but still chewy and somewhat pliant when you bend a piece. Transfer to a resealable plastic bag while the jerky’s still warm. Let the jerky rest for an hour at room temperature. Squeeze any air from the bag, and refrigerate the jerky. It will keep for several weeks in the fridge. Mix all ingredients then follow same directions as above.